Spectrum: A Colorwheel Quilt | OccasionalPiece--Quilt! Posted on May 10, 2016 by Elizabeth E.
You’ve seen this beauty before, as I’ve been working on it steadily since last summer. 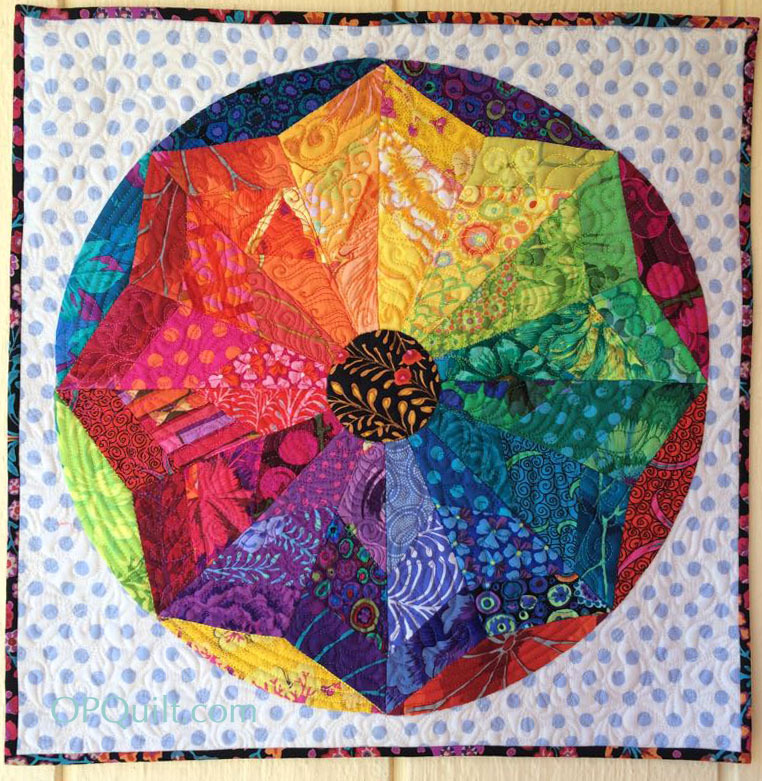 Since this summer is about to arrive, I thought I should finish it up and get it up in my shops at Craftsy and PayHip (for EU quilters), in case anyone wants a colorful wheel of color on their sewing studio wall. It’s also great for quilt swaps, or special gifts. I started on mine for a swap, but soon realized I wasn’t going to finish it in time, so made for her instead another colorful creation of mine, Colorwheel Blossom. (It was a colorful Kaffe Fasset fabric swap.) But then I had two quilts, so I gifted one to someone who loves and uses Kaffe Fasset fabrics, keeping one for myself. 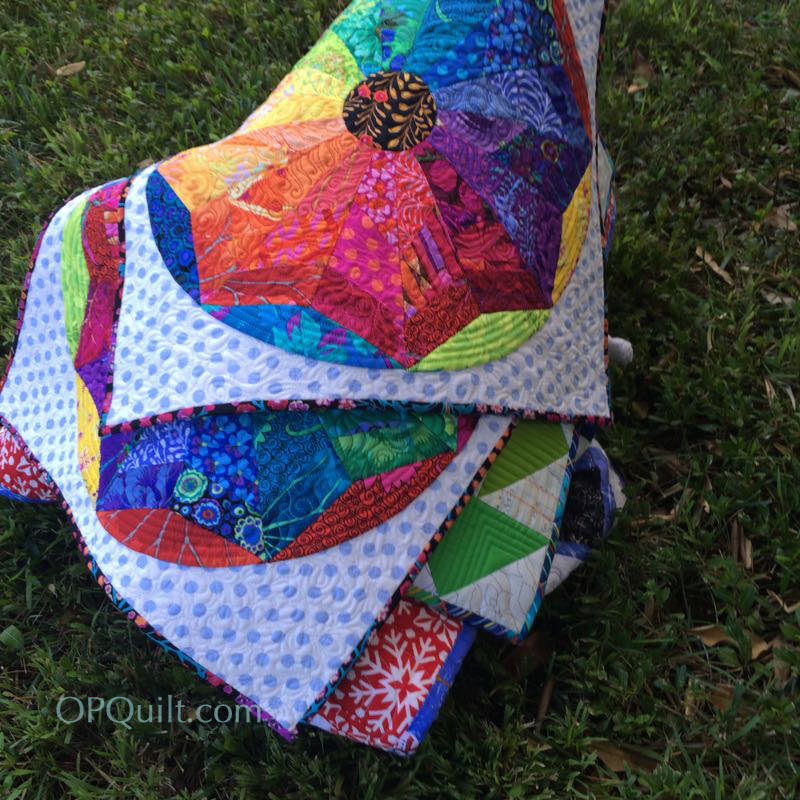 Before I sent my swap quilts off, I took them outside for some photos, and love this stack of fun (colorful?) quilts, a prism of quilty delights. The pattern has templates for English Paper Piecing, if you like to do that sort of thing (I do!) and full instructions for how to put your quilt together. 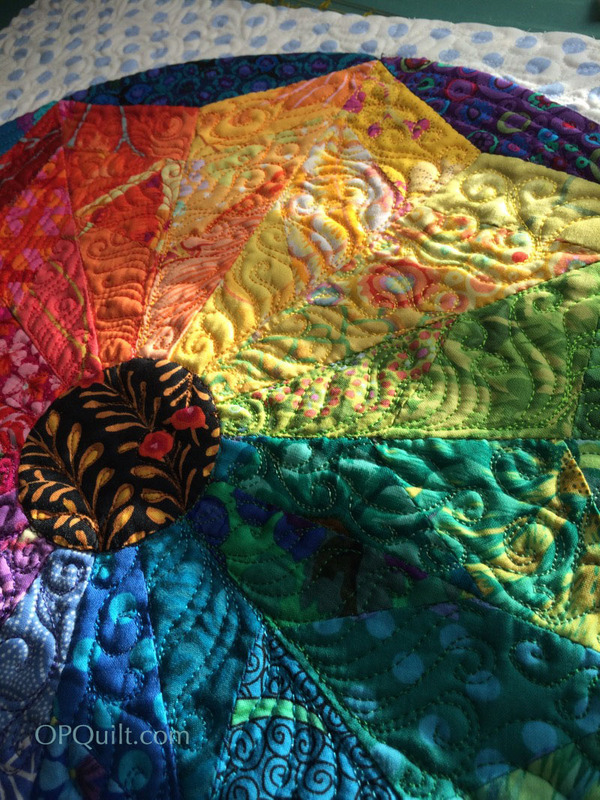 While the color wheel is 16″ in diameter, the quilt can measure up to 18,” depending on the size of your background. It is stunning made up in Kaffe Fassett fabrics, and I’m teaching it that way this Spring in classes at my local quilt shop. Enjoy! It’s a gorgeous quilt Elizabeth! And so clever of you to make one for yourself too! So beautiful. I would definitely be signing up for that class if I lived locally! 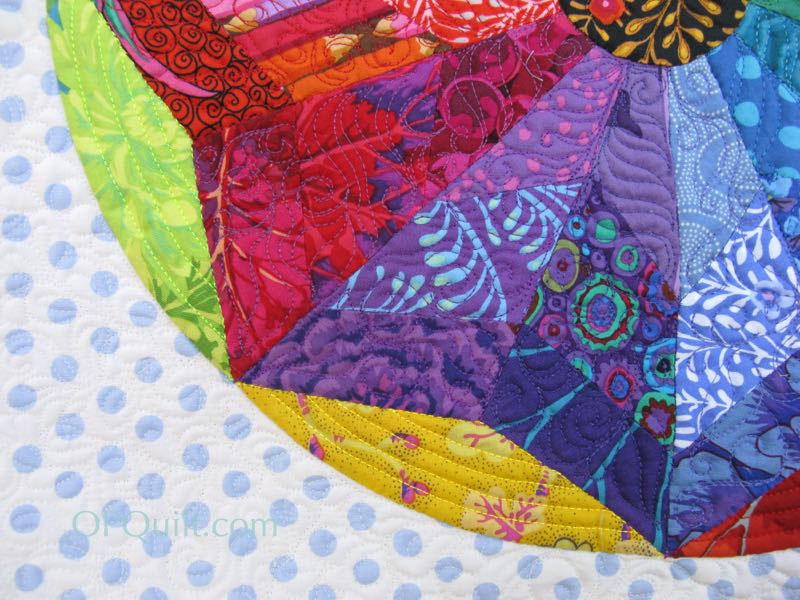 I have always liked the color wheel quilts, but I really love the pieced slices in this one. Beautiful! That quilt stack is quite yummy. Beautiful. We have been looking for a color wheel for the office! Such a great job of color blending! From the first image, I could have sworn that some spokes were solid fabrics, not pieced. But then your closeup confirms that they are all pieced. An amazing piece. Love it. This is such a beautiful quilt. The Kaffe fabrics are so rich looking and the dots set them off to perfection. Oh my! A whole pile of them. How could you part with them? ?